Popping in after a long hiatus from blogging and from a bona fide one-week vacation! Yes, folks, we actually closed the office between Christmas and New Year’s for the first time in the seven years since I started the company. I didn’t answer emails, didn’t check voicemail, nada! OK, well I actually did work, in the sense that I organized my office, shopped for supplies, emptied out my file cabinets of everything that was no longer needed, wrote up a professional development plan for my staff, paid bills and taxes, tweaked a few things on the website, sent out thank-you notes, wrote an article, monitored my online class (no longer available; see our Workshops page for current offerings), met with advisors and did some strategic planning for 2007. BUT…the beautiful thing was that I did it without my phones ringing off the hook, without getting bombarded with emails and IMs every two seconds, without a gazillion interruptions that make it impossible to complete a task or fully concentrate on something. Ahhh, it was divine! We’re going to hit the ground running tomorrow, when everyone else comes back from the holiday and wants to get casting underway. But I’m relishing my last few hours of calm and quiet. It was kind of fun doing some writing this week, too. 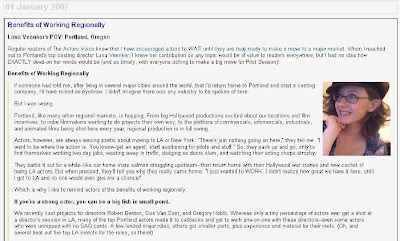 For a while now, I’ve thinking about getting back to writing and teaching again, so it was very timely that the lovely Bonnie Gillespie of Casting Qs and The Actors Voice, whom I’ve corresponded with over the years, was sweet enough to think of me for her January POV article for Showfax.com. I decided to write about working in the industry outside of LA and NYC, a topic close to my heart. Thanks, Bon! That was fun. It’s also been a kick working with this month’s students in my business of acting course (no longer available; see our Workshops page for current offerings). One of the students is a clown who has been in the industry for over 20 years! It’s great to hear her perspective on the acting business. 2007 is going to be a landmark year; I can feel it. Even though 2006 was insanely busy, we managed to assemble a great team and put all the other pieces in place for things to run like clockwork. Which means we can now focus on new ideas and goals. Yippee! I hope it’s a landmark year for all of you, too! Happy 2007! Where exactly IS the Valley of Light?